Rock glacier: Photograph of a rock glacier near McCarthy, Alaska. This is a lobate rock glacier that received its rock cover as talus was dropped from the steep slopes higher in the mountain. Then, as the glacier flowed into the valley, ice was lost, concentrating rock on the glacier's surface. 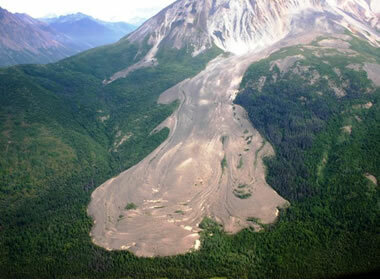 Image by the National Park Service, Wrangell-St. Elias National Park and Preserve. 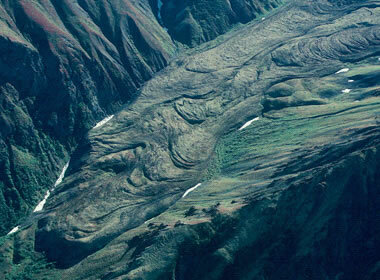 Rock glaciers: Photograph of rock glaciers in the Talkeetna Mountains of Alaska. 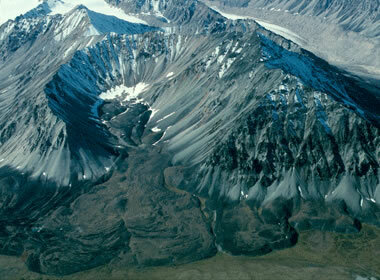 On the left side of the image, a rock glacier divides into two lobes as it exits a short valley headed by a cirque. To the right of the lobate rock glacier, a few much smaller rock glaciers have formed at the base of a talus slope. Image by the United States Geological Survey. A rock glacier is a mass of rock, ice, snow, mud, and water that moves slowly down a mountain under the influence of gravity. The rock glacier might consist of a mass of ice covered by rock debris, or it might consist of a mass of rock with interstitial ice. A gradient of compositions between these two states also exists. Unlike an ice glacier, rock glaciers usually have very little ice visible at the surface. If you are on the ground looking at one from a short distance away, it might not look at all like a glacier. The very slow movement, typically between a few centimeters and a few meters per year, also helps hide the rock glacier's identity. Movement generally initiates in the ice in the lower parts of the rock glacier. The rocks on the surface of the rock glacier then adjust to that movement. This sometimes results in ridges or flow features on the surface of the rock glacier. They often begin in a cirque or at the edge of a large talus slope, conform to the shape of their valley, and have a tongue-shaped end. Arcuate ridges are often present behind the tongue, and linear ridges sometimes parallel the valley wall. These ridges are hints that moving ice is present below. Rock glaciers are typically small. A large rock glacier might be fifty meters thick and a few kilometers in length. The rocks on the surface of a rock glacier can be almost any size depending upon their source of supply. Rock glaciers can form in a variety of other ways. Some develop from the melting of an ice glacier that was covered by a landslide, an ice glacier that encountered a mass of rock debris blocking its valley, or simply the wasting of an ice glacier that contains a large amount of rock debris. Related: What is a Salt Glacier ? Yellowstone rock glaciers: Photograph of numerous very small rock glaciers forming at the base of a talus slope along the Mt. Holmes trail in Yellowstone National Park. National Park Service image by John Good. How Do Rock Glaciers Grow and Shrink? The ice mass of a rock glacier generally grows from precipitation, local runoff, avalanche and spring discharge. The rock mass typically grows from talus dropping from the head of the cirque and from the valley walls. Rocks can also be added from landslides and at the terminus by accretion as the rock glacier advances. The sun heats rocks on the surface of a rock glacier, and that causes ice or snow present on the surface to melt. The melt water moves downward into the glacier and often freezes at the ice interface. Mud and fine rock debris are also carried downward. Snow, ice, and water can be lost from the upper portions of a rock glacier through ablation, melting, runoff, and evaporation. As a result, the surface of the rock glacier is usually covered with angular boulders in a wide range of sizes. Fine materials accumulate at the ice surface below. 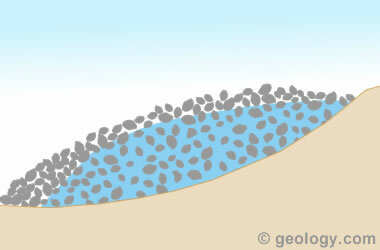 Ice cemented rock glacier: Cartoon illustration of an "ice cemented" rock glacier. This type of rock glacier can form in a variety of ways. It can form when ice and snow melt on the surface of a talus slope, infiltrate down through the rocks, and then freeze at depth. The result is a mass of rocks that are cemented together by ice. Rock glaciers that form from the wasting of glacial fronts or by accretion at glacial fronts often have this configuration. Ice core rock glacier: Cartoon illustration of an "ice core" rock glacier. This type of rock glacier forms when rock material is deposited onto the surface of an established glacier as talus or landslide debris. This produces a mantle of rock on the surface and a core of solid ice at depth. Rock glacier flow lobes: Photograph of an unnamed rock glacier with multiple flow lobes in the valley of Metal Creek on the north side of the Chugach Mountains, Alaska. Image by the United States Geological Survey. Rock glaciers covered with large rocks can be difficult and hazardous to cross. 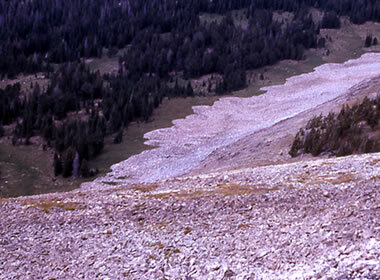 Like on a scree-covered slope, loose rocks can tilt or slide, causing a person to fall. A foot or a leg can be trapped between sharp adjusting rocks. Rocks resting on ice can slide quickly. If you drop your hammer or hand lens, you might be able to see it down there between the rocks but be unable to retrieve it. Be careful. Rock glaciers covered with smaller rocks are less hazardous to cross, but walk around them instead of crossing them if possible.